Q: What do you buy the man who has everything for his birthday? A: You don’t. You make him some artwork featuring one of his favourite things! Last year I struggled to find a birthday present for my husband, Dave, and then foolishly gave away the one good idea I’d come up with to his parents who were also struggling. 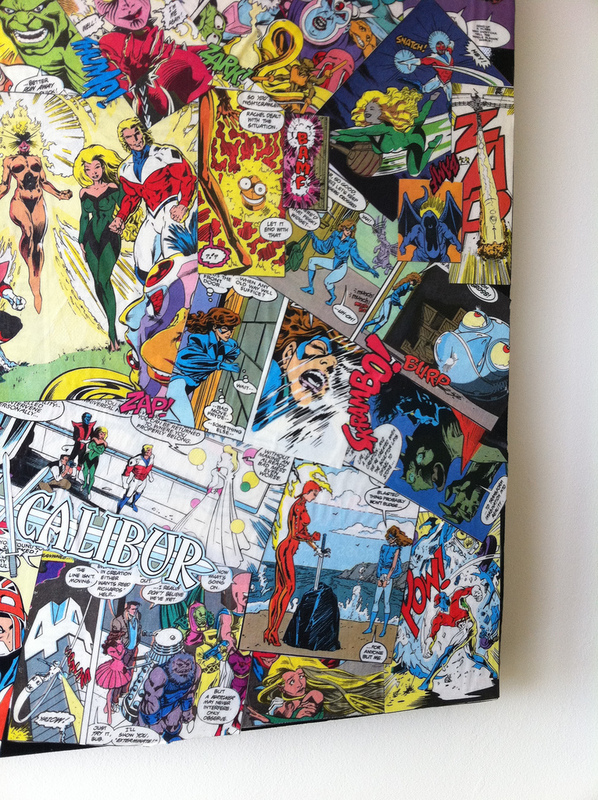 So, I decided to make him the comic book canvas I’d been thinking about making for ages. Since this was going to be a fairly lengthy project and thus hard to hide, I figured that I should probably tell Dave I was doing it, and also since it was for him, it would make sense to ask him which comic or superhero to feature. I’m not sure who I expected him to choose, but I was quite surprised when he said Excalibur. In retrospect, it is less surprising as Alan Davis is one of his favourite artists! With that weighty decision made, I started to trawl eBay for second-hand comics (with Davis on pencils) and picked up the rest of the supplies from Hobbycraft where I was thrilled to discover that they now sold Mod Podge. I coated the edges of my box canvas with some black acrylic paint so that I didn’t need to worry about trying to do neatly folded corners, and it also makes the finished canvas ‘pop’ nicely against the wall. I also like to think that it looks professional—am I kidding myself? The hardest part of creating the canvas was deciding how best to layout the images. 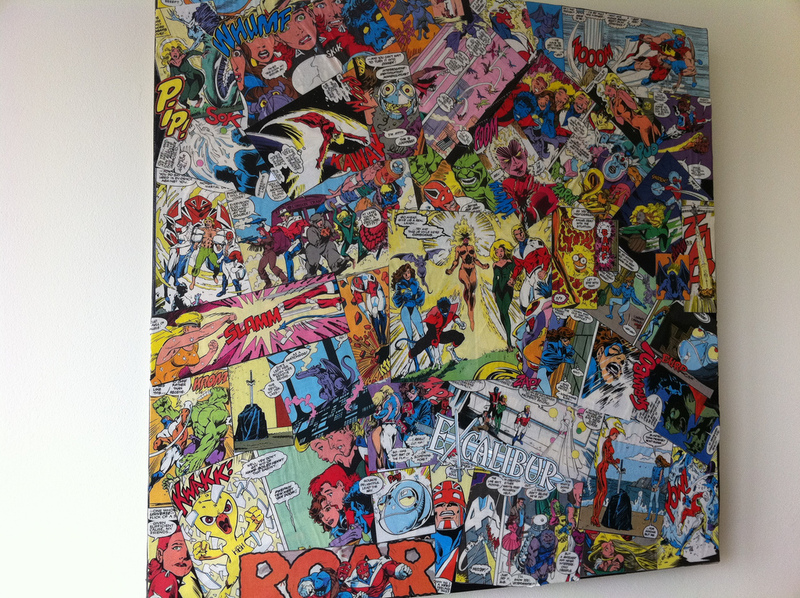 When I initially Googled for comic decoupage-work to get ideas I’d seen a few canvases where people had just laid things out in neat horizontal lines, so I tried that. And it looked rubbish. And then I tried to create an Exciting and Dynamic layout which didn’t really work for me either. The only thing that I knew for certain was that I wanted to put a large team ‘photo’ in the middle. So, one morning when I had the house to myself I stuck someSuperman: The Animated Series DVDs on for inspiration, collected up my pre-painted canvas, Mod Podge, and all my neatly snipped panels and just went for it. I think that if I had spent any more time trying to create the perfect layout I would have been paralysed by indecision for weeks. Once I had about 90% of the canvas covered I started snipping out lots of action words from panels. My idea was to enhance the overall comic (and give it a bit more depth) by layering POW!, WHAM!, BAMF! over little gaps and corners. It also came in handy for brightening up the occasional area which felt a bit too dark. I couldn’t have done this without my tiny super-sharp scissors!! You can see this layering really well in the above picture of the top left corner of the canvas. I love the PIP! and WHUMF! Despite the odd wrinkle here and there, I’m really pleased with the end result and I’m pretty sure Dave is, too, since he’s been keen to show it off to everyone! 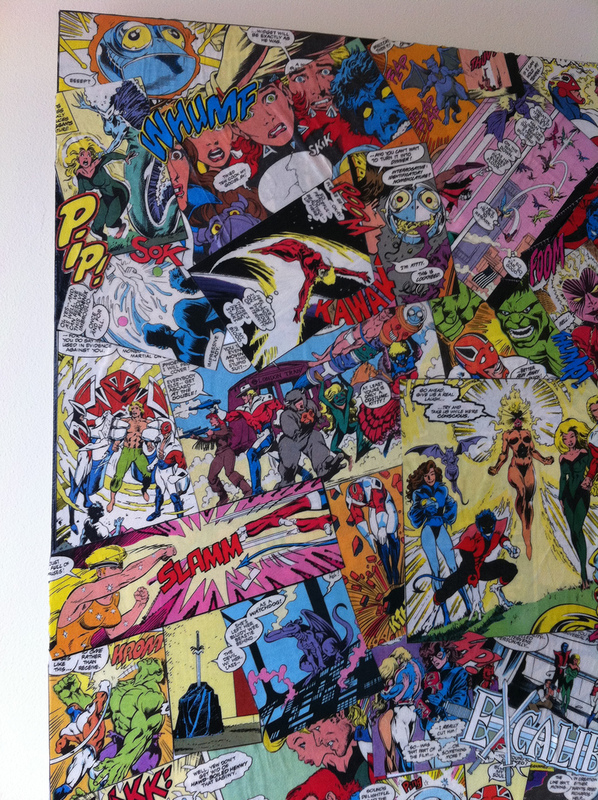 It really does look awesome on the wall in our comics room and I’m planning to make a couple of smaller canvases to go beside it as I found some fantastic old ads for Airwolf and Top Gun toys in the old comics!